Curiosity killed the cat & complexity killed the project !! The importance of simplicity in application development is paramount. Complexity is the number-one killer of projects today, and it comes into an application in many ways, including through excitement over new features, overly clever developers, and unfamiliarity with the Ruby on Rails framework. In this post, I would like to explain an extremely useful use-case of one of my favorite and highly popular tool Delicious. Let’s say I came across a useful URL that is relevant to the work that I am doing or stuff that I am interested in. For instance in this case, I came across rFacebook , a ruby gem for interacting with Facebook API. 1) Bookmarked this link on Delicious. As you can see in the image, the Addthis Addon already shows that it has been saved 391 times. 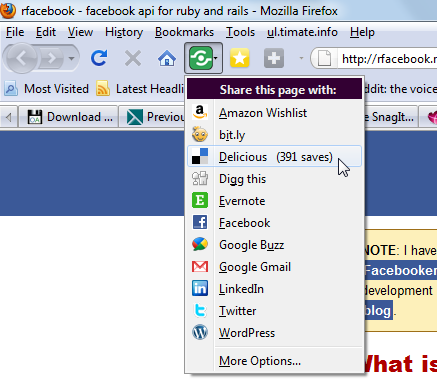 2) Select a few tags for instance rails & facebook in my case & click save. Once you have saved the link as well, it would go to delicious & increment the count by 1. Now it it showing 392 for me. 3) Click on the count to open all the saved items for this URL. 3) Now it shows all the users that have saved this URL & the tags they have used for this URL. 4) You can click on the tags to view other URLs that they have saved for these tags. Lastly, you can also add any of the users that you find useful to your network so that you can quickly browse their bookmarks quickly at any time. I have found this to be a very useful technique to discover new, useful & relevant content. Hope you find it useful as well. India’s first RubyConf is happening in Bangalore in March 2010, 20th – 21st. The conference was SOLD OUT. They have added 150 more seats. Facebook developers get some more good news. If you are worried about having a reliable hosting space for your Facebook application, you can get it Free. Joyent is giving free PHP5 hosting along with MySQL, Rails 1.8.6 ,Python free for 1 year, if you are a Facebook application developer. Other companies offering free hosting for Facebook developers include Jumpline.com & Freeunmeteredhost.com. A ComputerWorld article has named RoR as one of the top 5 technologies you need to look in 2007. Only one in the software, rest are Hardware related. It seems like every month a new technology emerges with the potential to change everything. Technology writers and analysts get hyperexcited. Everyone starts patting one another on the back and hugging. And two years later, we’re still talking about the promise of that technology, with little to show in the here and now.